My grocery shopping used to consist of buying lots of boxes. Boxes of snacks, breakfast cereals, frozen meals, or meals that simply required boiling and a flavor packet. Carrying my groceries from the car to my apartment was usually light and easy, unless I bought a few canned goods or some milk. During those years of grocery shopping, the heavy lifting that I did was on my body. Though the food was pretty light in my bag, the weight that it put on my body was starting to get heavy. When enough became enough, I decided to invest in myself and get that weight off of my body. I first started looking at what I was eating. As I started to read the ingredients on the box, I got confused. What was all of this stuff I couldn’t pronounce? Why was the sodium level so high? Why did the foods I was eating have mostly fat and carbs, with no vitamins, fiber, or minerals? I started buying fewer boxes and more real food that has weight, like squashes, greens, carrots, beets. I also added exercise and started paying attention to my physical hunger. Eventually, the weight I carried on my body shifted to the real foods in my shopping bags I bought each week. And I don’t mind it all. In fact, I love it. 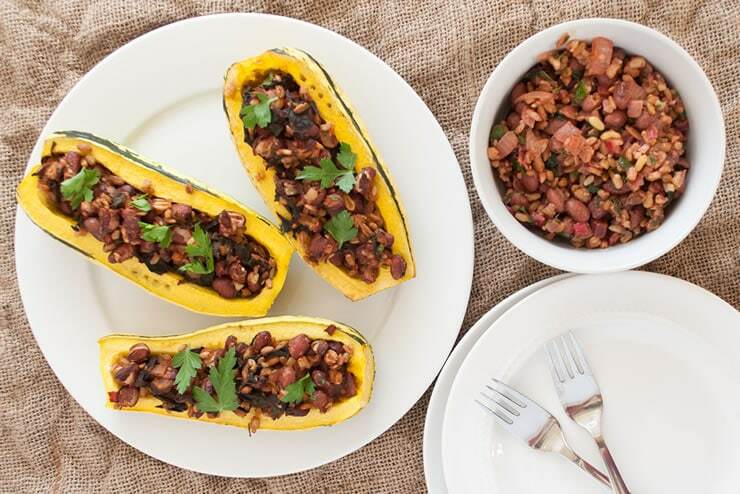 Delicata squash, grains, and beans all have some good weight to them and will be equally as filling. Delicata squash is a great fall squash that has an edible skin. With the exception of the seeds, very little of this squash goes to waste. It’s long and narrow shape is also a perfect vehicle for stuffing. This filling has Swiss chard, onions, garlic, Bob’s Red Mill Small Red Beans, and Bob’s Red Mill Whole Grain Medley. The Small Red Beans taste similar to pinto beans and the Whole Grain Medley is a smattering of hearty whole grain goodness. It combines hard red wheat, long grain brown rice, oats, rye, triticale, barley, kamut, buckwheat, sesame seeds into a great sampler of grains. I think it’s a great way to get introduced to lots of whole grains. 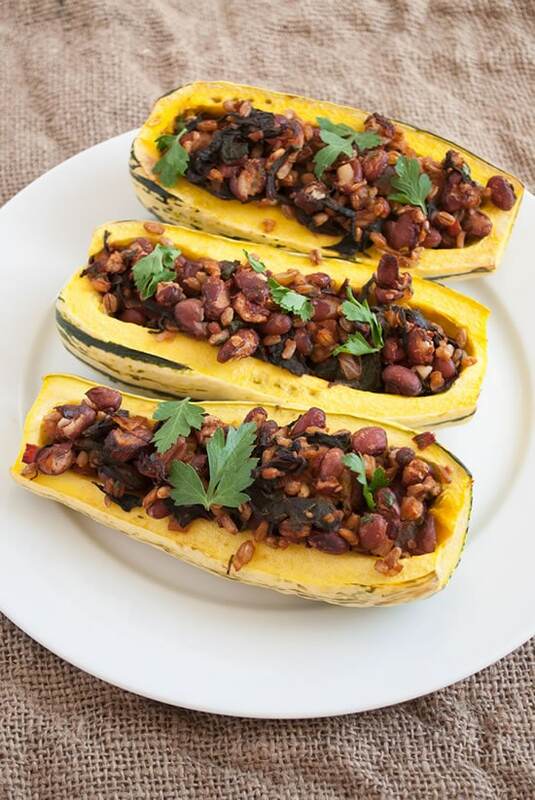 Though this recipe is vegan and vegetarian, the combination of the beans, whole grains, and squash will leave you full and satisfied, even if you’re usually a meat eater. If you want something extra, consider making a full-fat yogurt dressing with some cumin and paprika and drizzling that over the squashes. After completing this October Unprocessed challenge, I hope you feel inspired to kick the most processed foods, especially the ones that don’t pass the kitchen test, to the curb for good. If you are looking for a healthy but filling dish this is the recipe you are looking for. This entree hits all the main categories you could ask for and would be a perfect plate to fill a family. Presoak the beans overnight in a bowl with enough water to cover them. When the beans are ready, drain, and rinse the beans. In a pot, combine 2 cups water, beans, and a pinch of salt. Cover and bring to a boil. Reduce the heat and simmer for 90 minutes. Check the beans periodically and add more water if the beans are no longer covered by water. While the beans are cooking, cook the grains. In another pot, combine 1 1/2 cups of water, 1/2 cup of Whole Grain Medley, and a pinch of salt. Bring to a boil, then simmer on medium low heat for a 60 minutes, or until fully cooked. When done, transfer to a large mixing bowl. Remove and dice the ribs of the Swiss chard, and cut the leaves into bite-sized strips. In a sauté pan, bring 1 teaspoon of olive oil to medium-high heat. once hot, add the onions, garlic, and Swiss chard ribs. Cook until soft, about 3-5 minutes. Add Swiss chard leaves, stir, and cook until wilted, about 5 minutes. Transfer to the mixing bowl. Once the beans are done, drain them and add them to the mixing bowl. Add parsley, spices, and lemon or lime juice, and stir to combine. Adjust seasonings as needed. On a cutting board, cut a little bit of the top and bottom off the squash. Place on the cutting board vertically and slice down the length of the squash, creating two halves. Scoop out seeds with a spoon and discard. Repeat with all squash and place on a foil-lined baking sheet. Spoon filling into squash boats until full, then bake in the oven for 20-25 minutes, until the squash is soft and cooked through. The beans and grains can be done the day before. If you have a pressure cooker, you can also pressure cook the beans. Combine a teaspoon of vegetable oil, the soaked beans, and 3 ounces of water in the cooker, then cook on high for 5 minutes. Once time is up, use a natural release. As a contributor to October Unprocessed, I was provided free Bob’s Red Mill product to help create this delicious recipe. All opinions are my own. Aimée Suen is a Nutritional Therapy Practitioner who shares nourishing, gluten-free recipes and nutrition wisdom at Small Eats. She is driven to help others enjoy whole foods and empower them to find their own health in all aspects of life, one small step at a time. When she’s not in the kitchen, she’s practicing yoga, in the gym, or learning something new. You can find Aimée on Instagram, Twitter and Pinterest.